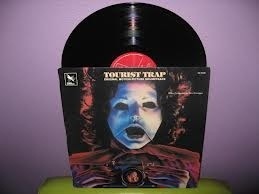 “Tourist Trap” is a fairly unknown (but certainly with its own cult following) 1979 film that I stumbled upon accidentally. I’d certainly heard the title before, but often confused it with Tobe Hoopers’ Texas Chainsaw follow up “Eaten Alive” (also known as “Death Trap”). After checking out a few clips, I was determined to give it a shot. “Tourist Trap” starts out in classic horror style, a group of teenagers get off the main highway and become lost, stumbling upon a backwoods wax museum run by a (seemingly) kindly gentleman named Mr. Slausen. One by one they are picked off and turned into mannequins by Slausens deranged brother, but is there more going on than meets the eye ? The main reason I checked out this film to begin with was because of its star, Chuck Connors. He played the title character in one of my favourite exploitation flicks, “The Mad Bomber” (http://www.youtube.com/watch?v=Pl65laykr3E&feature=relmfu). Connors is excellent here, balancing charm and menace effectively. The rest of the cast is filled out by a typical 70s/80s horror cast (including Tanya Roberts, who would go on to play Donnas mother in “That 70s Show”), fine, but not great. It’s Connors’ show, and he does a great job anchoring the film. 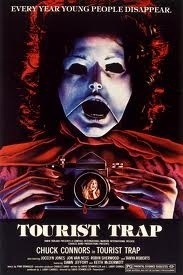 Despite its PG rating, “Tourist Trap” is a genuinely unsettling film. The masks the killer wears are reminiscent of Leatherface (TCM being released 5 years prior) and the mannequins are extremely creepy. The killer also possesses telekinetic abilities, which is somewhat convenient, but an interesting aspect nonetheless. I’ve always found mannequins / dummies / dolls to be fairly creepy (especially in horror films) and they are used to great effect here. In addition to this film I’d also recommend the underrated “Dead Silence” and “Dolls”, which was an unofficial precursor to “Puppetmaster” (which was also directed by the writer/director of “Tourist Trap”). 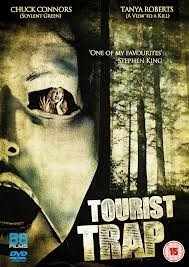 It’s a bit hokey at times, but in the end, “Tourist Trap” is a fun ride. This entry was posted in Reviews and tagged 2012, cult, dummy, gore, Halloween, Horror, Horrorthon, mystery, October, review, Scary, thriller, trap by lazron. Bookmark the permalink.